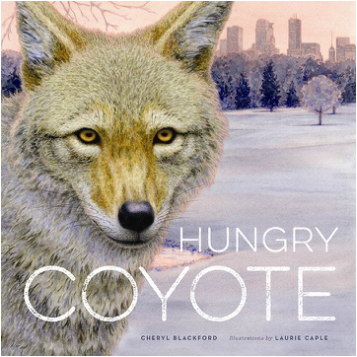 Hungry Coyote is a fiction picture book for ages 3-8, but really its for anyone who loves lyrical prose, gorgeous illustrations, and/or coyotes. I'm thrilled that Hungry Coyote won the 2015 Moonbeam Award in the category of picture books for ages 4-8. If you're interested in knowing more about how and why I wrote Hungry Coyote, check out this video on You Tube (created by NetBriefings of St. Paul, Mn) or scroll down to the bottom of this page. Coyote with his Moonbeam medal. Visit my Teachers/Parents page to download a teacher guide or a coyote mask for coloring, see links to information about urban coyotes, and listen to sound recordings of coyotes. I begin every morning with a walk, usually on trails that lead me through beautiful oak woods and along the shores of a lake. Since I live in Minnesota for most of the year, some of those walks are cold, VERY cold (sub-zero temperatures do not deter me). I love to see the changing of the seasons through the plants and animals I encounter on my walks. One winter, I spotted a lone coyote slinking across the lake. He stood for a moment, watched me, and then continued on his way. That started me thinking about coyotes living in the city. What do they eat? How do they avoid people? What are their lives like? After doing some research I discovered that coyotes are thriving in many of America's major cities, such as Chicago, Boston, New York, Los Angeles, and yes, Minneapolis. And so that lone coyote became the star of his own book.